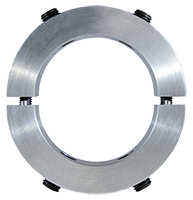 CG-Series two piece split thrust collars are engineered for toughness, wear resistance and precision using hardened ductile iron and 4140 steel. Fully machined on all surfaces, they have hardened alignment dowel pins, four symmetrical locking screws to prevent twisting on the shaft during installation and grade 8 closure bolts for maximum clamping force. They are dimensionally interchangeable with Dodge R-series and RTL sleevoil bearing shaft collars.